Astronauts aboard the International Space Station opened the door on the lab's first commercial resupply craft Saturday, accessing more than 1,000 pounds of food, clothing and experiments stowed inside. But one of the most vital functions of the privately-owned cargo ship - its ability to safely return space station equipment to Earth - is yet to be demonstrated. The space station's Expedition 31 crew opened Dragon's hatch Saturday at 5:53 a.m. EDT (0953 GMT), and the astronauts plan to spend 25 hours removing the craft's supply cache and installing equipment tagged for shipment back to Earth. "I spent quite a bit of time poking around in here this morning just looking at the engineering and the layout, and I'm very pleased," said Don Pettit, a NASA flight engineer living aboard the space station. "It looks like it carries about as much cargo as I could put in my pickup truck." 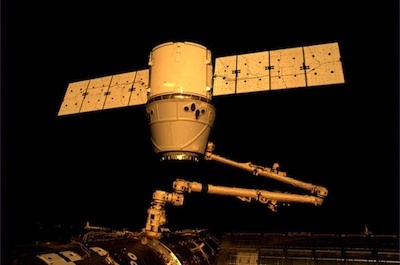 Pettit was at the controls of the station's robotic arm Friday when it grappled Dragon after a cautious laser-guided rendezvous with the outpost. Most of the crew's cargo transfer duties will not begin until Monday, according to Holly Ridings, NASA's lead space station flight director for the Dragon mission. "We are going to give our crew some time off," Ridings said. "They've been working very hard over the last couple of days, so we're going to give them some time off over the weekend. 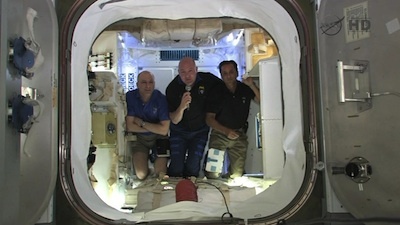 Then Monday and Tuesday are very big cargo days on the space station." Pettit, Andre Kuipers, and Joe Acaba will rotate time removing and adding cargo in the Dragon spacecraft. None of Dragon's payloads are deemed essential for the space station by NASA officials. The ongoing mission is a test flight to prove the Dragon spacecraft is ready for regular cargo deliveries to the complex, which could begin as soon as September. Engineers packed the commercial spaceship with 1,146 pounds of equipment and supplies before Dragon's launch, taking advantage of the test mission to supplement cargo dispatched to the space station on other flights. "We heard that there might be a little crew care package in here with some goodies in it, and we don't know what they're going to be," Pettit said in a news conference from inside the Dragon spacecraft. "It's kind of fun to keep that as a surprise just because it's nice to get a surprise every once in a while from mother Earth." The cargo includes enough food for 162 crew meals, clothing, and pantry items. A package of patches, pins and other mementos is also stowed aboard Dragon to commemorate the historic mission. The crew provisions account for 674 pounds of Dragon's payload. The mission delivered a commercial NanoRacks experiment module with student experiments investigating microbial growth, water purification, and other pursuits. Astronauts will also unload ice bricks and cargo bags carried inside Dragon for future transfers of experiments and equipment. The craft also contains computer supplies, such as a laptop, batteries, and power supply cables, according to NASA. "It looks like it carries about as much cargo as I could put in my pickup truck," Pettit said. A key capability of Dragon not demonstrated on this flight is transporting bulky exposed hardware and research payloads to the station. NASA plans to launch unpressurized cargo in Dragon's trunk section on some of the ship's 12 future flights to the complex. The external cargo and spare parts would be mounted in the future on the outside of the station for staging in case of equipment failures. The Dragon capsule will depart the space station and splash down in the Pacific Ocean on May 31, becoming the first robotic vehicle to return from the complex and land on Earth's surface intact. Russia's Progress resupply craft, Europe's Automated Transfer Vehicle, and Japan's HTV cargo ship are all disposable. They burn up in Earth's atmosphere during re-entry. Another commercial logistics freighter - the Cygnus spacecraft being developed by Orbital Sciences Corp. - will also be destroyed in a fiery re-entry and the end of its missions. "Dragon is really the main means of carrying cargo back from the space station," said Elon Musk, SpaceX's founder, CEO, and chief designer. Taking advantage of Dragon's cargo return capacity, the space station crew will tuck 1,455 pounds of payloads into the craft's cabin for landing. Items selected to return home include a water filtration bed, a pump from the station's urine recycling system, water containers, and a multiplexer for the Japan Aerospace Exploration Agency. Dragon will return hardware from several experiments on the space station focusing on planet research, liquid polymers, alloy materials. The astronauts will also store unneeded spacesuit components inside Dragon for landing. Learn more about Dragon's cargo on the trip to and from the space station. Future Dragon missions will haul up to 5,500 pounds of equipment on the trip home. "It will be great to have significant payload down capability once again," said Don Pettit, a space station flight engineer. "Everybody talks about getting payload up to station, but one of thing that's sorely missing in the wake of the shuttle retirement is getting payload back down. We have all kinds of useful things that we want to get back down to Earth but currently don't really have a way to get them back down." The space shuttle could return exposed cargo in its payload bay, and shuttles launched and landed with pressurized logistics modules to bring back experiment samples, broken parts, trash, and other gear from the space station. Dragon is only able to land with cargo packed in bags or containers inside the ship's pressurized compartment, but it can return valuable frozen experiment samples and hardware needing repairs. The craft's trunk separates before re-entry and burns up in the atmosphere. "Currently, we have no way to get our frozen samples back," Pettit said. "Crucial to the life science experiments that we are doing on space station, particularly the human physiology experiments, we have blood, urine, and spit samples, we have all these things frozen in our freezers. These samples have to remain frozen all the way to the laboratory to where they're going to be analyzed. Currently, Dragon will be the only way to get these samples back to Earth, and that will allow the science behind all our human physiology [experiments] to continue."